The CIA under the incumbent Presidency of Donald Trump has seen the use of lethal drones sharply escalating in attacks on suspected terrorists away from the President’s declared, official wars. Officially, in 2017 and 2018 to date, Trump has launched 238 drone strikes worldwide according to data provided to The Daily Beast by U.S. Central Command (CENTCOM) and the drone-watchers at the Bureau of Investigative Journalism in London. However, this official statistic of drone strikes on the full-fledged acknowledged battlefields of Iraq, Afghanistan, and Syria has ironically, proven far more difficult to track than those in shadow and proxy war zones—and knowledgeable observers like Chris Woods of the UK’s Airwars organization believe that the true center of the drone strikes has been muzzled as the Trump administration moves towards less transparency and accountability of its military drone operations abroad. The drones, an inheritance from the previous Obama and Bush Presidencies was by no means a light affair. The United States has made weaponized Unmanned Aerial Vehicles (UAVs), or armed drones, a major part of its fight against Al Qaeda and the Afghan and Pakistani Taliban, using them to carry out targeted killings on both Afghan and Pakistani territory. 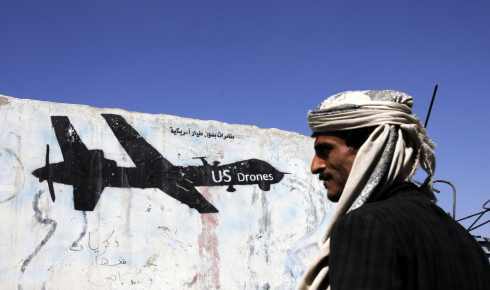 In 2009 and 2010, Obama launched 186 drone strikes on Yemen, Somalia, and Afghanistan. Pakistan however, is at the top of this list, with 424 drone attacks since 2004. Over 2,500 people have been killed in US drone strikes, of which at least 350 were civilians. There were ten times more air strikes in the covert war on terror during President Barack Obama’s presidency than under his predecessor, George W. Bush. Obama’s effort to impose rules and procedures upon the drone program included the enactment, by executive decree, of standards very loosely analogous to international law requirements that apply in war time to lethal strikes. Those standards were vague, and the ones upon which they were based were never meant to apply in countries in which the US is not at war. Despite his attempts to both make targeted killing strikes more centralized and accountable internally, all of Obama’s changes were, in one critical way, fundamentally deficient. Because all of them were imposed through executive orders, they would do little to bind his successors. Resultantly, under the Trump Presidency, the drone policy was changed in 2017, after Mike Pompeo, the C.I.A. director at the time, made a forceful case to President Trump that the agency’s broader counterterrorism efforts were being needlessly ‘constrained’. President Trump promptly relaxed the rules of targeting and exempted certain geographic regions from their coverage. He also issued the CIA renewed authority to conduct strikes against suspected terrorists without the involvement of the Pentagon. Now, he is apparently determined to further reassert CIA control over lethal drones by establishing the agency’s own drone base in Niger, broadening the agency’s lethal reach into Libya and other parts of Africa. Whereas Obama operationally expanded but bureaucratically constrained drones’ use, on record, Trump’s new rules instead vest military commanders with strike decisions, without requiring approval from the White House. Most daunting in this uptick of drone authorizations is the knowledge that President Trump is neither concerned nor stymied by the idea that this new framework of military drones as a combat tool, requires his administration to be accountable and transparent with the figures. Moreover, although targeting terror suspects with UAVs in official combat areas is deemed legal under international law treaties, it is the use of the technology outside a declared zone of combat–i.e., Iraq and Afghanistan—that has brought international criticism. Complicating the picture in Pakistan is the fact that the UAV-targeting program is believed to be operated by the CIA in the Obama era; a number of disclosures by senior U.S. officials have all-but confirmed the operations. The distinction between military applications and covert CIA use of drones has become a point of contention, as are issues pertaining to collateral damage and legal justification. Under the guise of official secrecy law and customs, “covert actions” taken by the CIA are not generally acknowledged by government officials after they happen. And without such acknowledgment, the public is left without meaningful information concerning what the government is up to, even when those actions are documented to have taken innocent lives. Human rights organisations and even some former US military commanders argue that drone strikes inadvertently increase terrorism by exerting a “blowback” effect. Their logic is simple. Drone strikes kill more innocent civilians than terrorists, which radicalises affected populations and motivates them to join terrorist groups to retaliate against the US. Strikes in Somalia and Yemen have increased threefold under President Trump. These strikes are already destabilizing an important part of the world, and they are causing more civilian deaths for which the government will refuse to answer. The CIA’s authority to reach into new regions is sure to cause even more. It is worrisome that while the non-profit organizations or thinktanks such as New America Foundation, the Long War Journal, and the London Bureau of Investigative Journalism offer official statistics on drone strikes, the numbers differ, and it is increasingly worrisome and alarming that the U.S. government itself neither confirms, or denies, nor releases its own data on drone strikes. One of the only public acknowledgments on US policy was issued as far back as 2012 in a speech by John Brennan when he stated that there were barely any civilian deaths in Pakistan as a consequence of these targeted strikes. This struck the Pakistani nation as an implausible claim, eliciting anger at American chauvinism from the liberal, educated class in urban cities. To America, the blowback of local populations should matter, not because of the argument that anti-American sentiment may be channeled into radicalism as most counter-terrorism analysts who speak against the use of combative measures assert, but public opinion in the states the US intervenes in should matter because the liberal, middle class of these countries forms the heart of an active civil society which the U.S. counts on to serve as a counterweight to the radical segments of any society. When members of governments, media and business sectors view American foreign policy with distrust, for example as the Pakistani academia did in the throes of the Obama era strikes in North Waziristan, their anger and frustration at an aggressor US administration shapes government and global opinion, resulting in further rifts between bilateral relations of the two states. This complicates and creates impediments in successful global counter-terrorism operations against transnational terrorist threats. As of September 2018, the C.I.A. is poised to conduct secret drone strikes against Qaeda and Islamic State insurgents from a newly expanded air base deep in the Sahara and the Pentagon has been given the unambiguous lead for such operations. The Pentagon’s Africa Command has already carried out five drone strikes against Qaeda and Islamic State militants in Libya this year. They claim that adjacent to Libya’s borders with Niger, Chad and Algeria, the area’s seminomadic residents are heavily involved in the smuggling of weapons, drugs and migrants through the stretch of deserts in Southern Libya, allying with Islamist militias, including Al Qaeda in the Islamic Maghreb, which operates across Algeria, Mali, Niger and Libya. Security analysts question why the United States needs both military and C.I.A. drone operations in the same general vicinity to combat insurgents in Libya. Further to the point, it is deeply telling that Pentagon is considering withdrawing nearly all American commandos from Niger in the wake of the deadly October ambush that killed four United States soldiers, making it easy to perceive how the resentment amongst locals for US operations has arisen, especially in the more isolated, rural areas of the country. Under the Obama administration, officials defended drone strikes as a legal means of self-defense in its armed conflict with al-Qaeda and the Taliban post-9/11. However, it remains to be seen how the administration under President Trump can defend or justify its upsurge in CIA spearheading increased UVA operations, especially when Trump’s election campaign echo of isolationism and non-interference are put in perspective. It is further ironic, that US defense policy has given the go-ahead to such new, ambitious military operations in Africa this year citing IS and Al-Qaeda threats, when the President has categorically stated in an announcement tweet citing total ‘defeat of IS’ where he revealed his decision to pull out American troops from Syria a mere two months later. International pressure must be leveled for the United States to publicly amplify the operational necessity of drone strikes by providing greater detail about the dangers posed by terrorist targets (a move that would, in turn, disclose the administration’s targeting list); and disclose the “basic contours” of the targeting-review process. If the current Trump administration continues weaponizing its operations abroad, the strikes may have the unintended consequence of creating enemies where none existed, creating space for anti-Western IS-like ideology to ferment in its place. With the exit of US troops from Syria and a sharp reduction in the number of US troops in Afghanistan the use of air power and drones is likely to rise sharply.